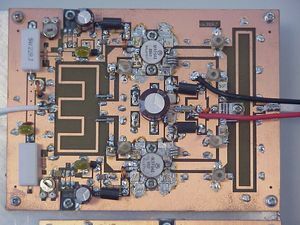 This article describes the construction of a 100-Watt, 70 cm amateur band linear power amplifier. It is the result of a protracted period of experimentation during which I investigated a number of final amplifier stages from obsolete UHF FM 2-way radios. All used the ubiquitous MRF646 UHF power transistor (or its equivalents). The intention was to find a circuit that could be duplicated and biased into Class AB for SSB operation on 432 MHz. In the end, none of the circuits tested was found to be quite suitable, so armed with a calculator and Smith Chart (and a good deal of blind optimism! ), I arrived at the design presented here. The result is an amplifier that met all my criteria of cost, output power, gain, stability and repeatability of construction. 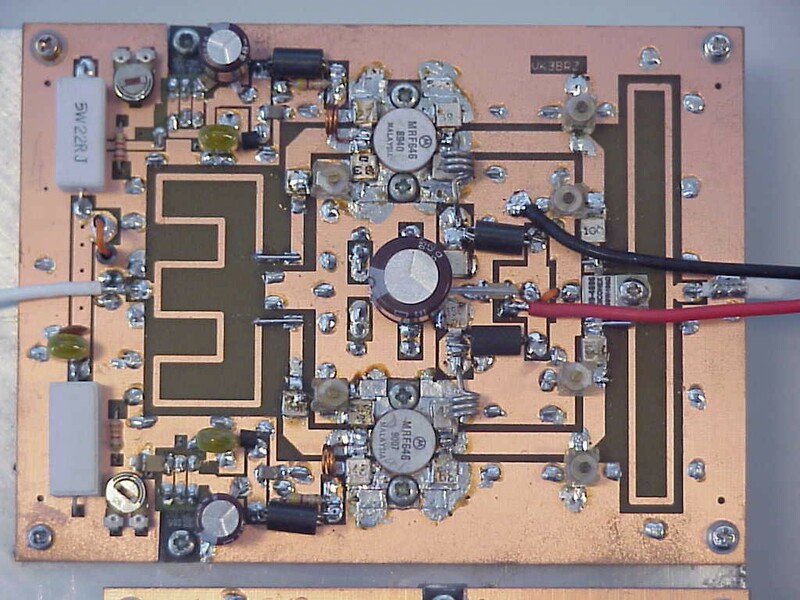 Powered from a well-regulated 13.8VDC supply, this amplifier will produce 100W RF output with about 18-20W of drive. The 100W amplifier board consists of two identical amplifiers each using an MRF646 developing 50W, combined with Wilkinson hybrids at both input and output for a total output of 100W. The Wilkinsons are implemented as microstrip transmission lines on the board. For a thorough explanation of the theory behind Wilkinson hybrids, see Ham Radio, January 1982, “Wilkinson Hybrids” by Ernie Franke WA2EWT. 1. Very good isolation between ports, so the two transistors do not inter-act at all, and if one transistor fails, the other one will likely survive. 2. No need for accurately matched transistor characteristics. 3. Each transistor stage can be tested independently before connecting the links to the Wilkinsons (note the small gaps for links on the PCB at both input and output combiners). This also facilitates fault-finding in the event of failure of the amplifier. 4. The original design was a single-transistor 50W unit. The Wilkinsons were the easiest way to obtain 100W without totally re-calculating all the matching networks (a very time-consuming job!). The printed circuit board also contains the bias supply circuits for each RF transistor. Separate bias adjustment is provided for each transistor, eliminating the need for closely matched transistors. Here some photographs for details of the component layout (click on the picture for a larger one). 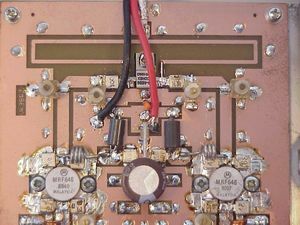 Several boards were constructed, including an amplifier with two of these boards combined with external Wilkinsons to produce 200W. 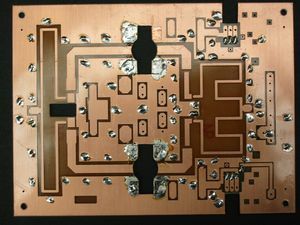 A colleague, VK3FMD, has also constructed two boards with the same results, so the design is very reproducible and reliable. Before purchasing new MRF646s, try looking for some obsolete commercial FM 2-way radios like Motorola, Philips or Plessey. Many of these have an MRF646 in the final that can be salvaged. This might be even cheaper! Click here to download the PCB layout (Eagle PCB layout environment). Select D1 & D2 for a combined forward voltage of approx. 1.2V These diodes are mounted under the circuit board, in thermal contact with the heatsink. Use ample heatsink compound to ensure good thermal contact. Adjust bias trimpot for PA collector idle current of approx. 100 mA. Note: The bias circuit is contained on the PA circuit board. Two separate bias circuits are used to allow individual adjustment of quiescent collector current for each transistor. 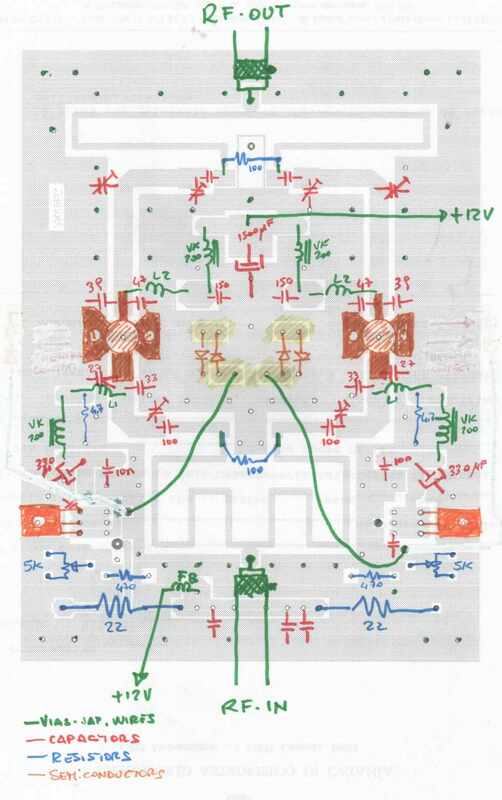 The four islands (marked yellow) in the middle of the board are there for the diodes. Two wires makes the connection between the diodes to the transistor. 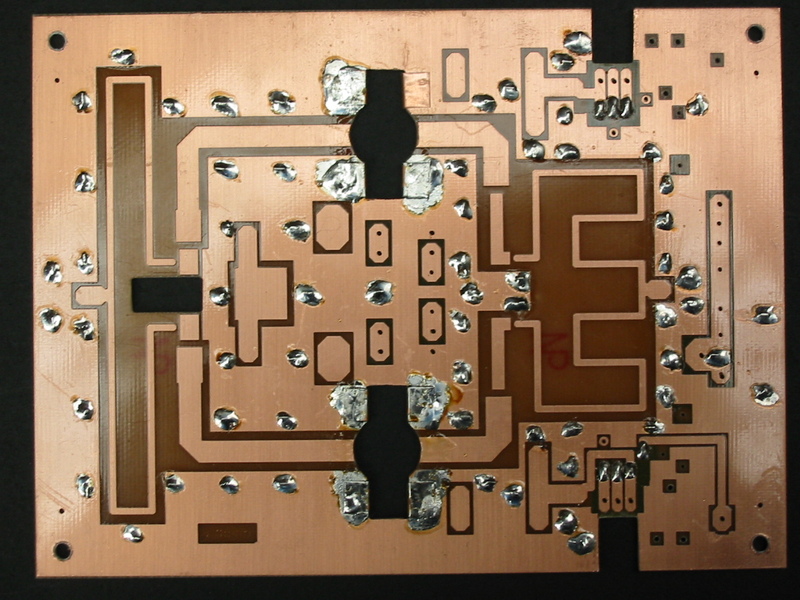 Place the wires UNDER the PCB to eliminate accidental RF coupling from the input circuitry. The capacitor (10nF is fine) from the base of the BD139 to ground is only for low frequency by-passing. 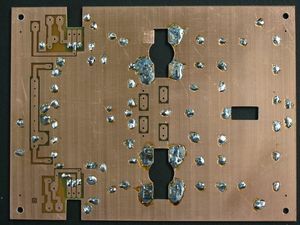 Solder some copper foil under each emitter flange to join the top and bottom ground planes of the PCB. This is a very high RF current area. 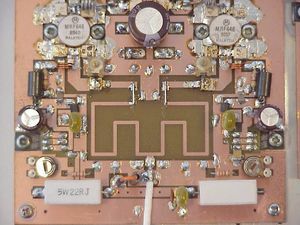 The wire from the supply track of the bias circuit (the orange wire in the photos) goes straight to the power supply PCB pad ( near the collectors) passing through to the underside of the board. 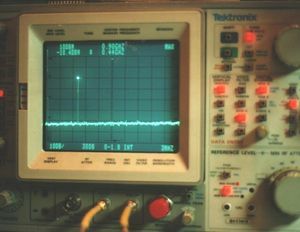 A ferrite bead is slipped over this wire at the bias circuit end. 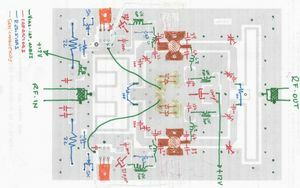 Alternatively, you can leave the DC supply always connected to the RF transistor collectors and switch the bias supply on and off for TX/RX. It is good practice to place a suitable ferrite sleeve on the collector DC supply cable. At the input can be used two 220 ohm/0.25W carbon resistors in parallel (good enough). The precision is not important. +/- 10% is fine. More importantly, they should be mounted with minimum lead length to minimise the series inductance. 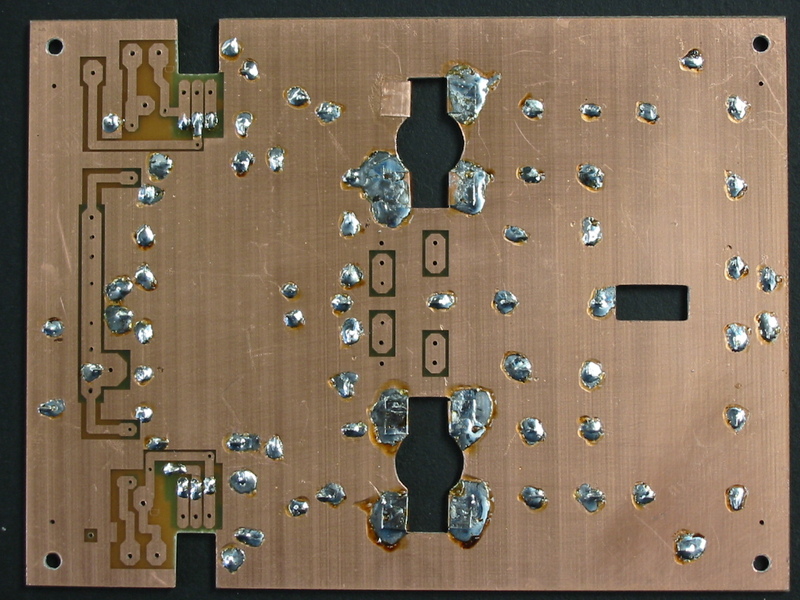 The photographs show a 100-ohm non-reactive load resistor at the output combiner specifically intended for this purpose, but good results have been obtained with carbon resistors. Make sure the capacitors around the base and collector of each MRF646 are mounted as close as practical to the transistor body. They can only be mounted after the transistor is soldered in place. I used metal-clad micas which can withstand more heat when soldering, but the ATC chip capacitors are very good too. Do not connect the base chokes to the MRF646s until you are absolutely sure you have approximately 1.2V from each bias supply transistor. Otherwise you might burn out the MRF646s if you made a construction error or have a faulty diode etc. Then you can adjust trimpots for approx. 100mA quiescent collector current in each transistor. The diodes I used were a 1N4007 in series with a 15V zener (any small 1W zener is OK) in the FORWARD bias mode. You will find most rectifier diodes have only about 0.5V drop, whereas zeners are closer to 0.6V. For the MRF646 is important that you should check their mounting surfaces for flatness. I find most salvaged transistors are not very flat, which is detrimental to heat transfer into the heat sink. My solution is to run the transistor over a file to ensure a good flat surface. Concerning the capacitors: I used Philips mylar 9pF trimmers at input and output. These are surprisingly good. I have had no problems with these trimmers in my amplifiers. 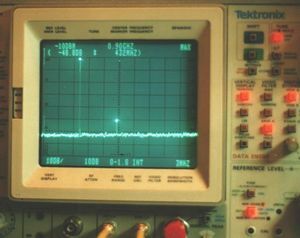 Several copies of this amplifier (9 at the last count) have been constructed and are in regular operation. All operate exactly as expected with no problems encountered. 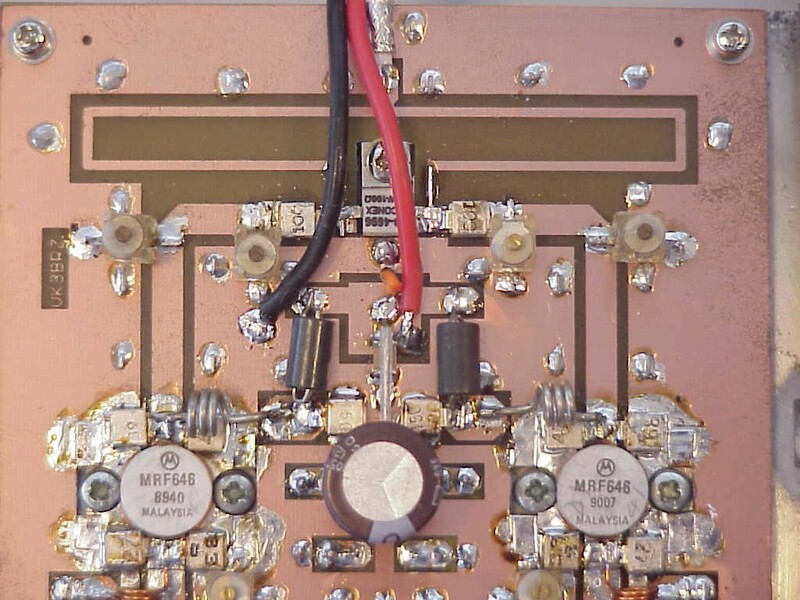 The fixed value capacitors in the RF matching circuitry must be metal-clad mica or transmitting-type ceramic chip units. Nothing else is suitable. When you are ready to test the amplifier, start by setting the bias to each transistor. You can disconnect the RF choke on the base of the opposite transistor so that only one transistor at a time draws collector current. About 100 mA per transistor is OK. Note the short wire links on the Wilkinsons. Don't put these or the 100 ohm resistors in yet. You can test each "half" of the amplifier independently to ensure you can get approximately 50W out with 8-10W drive. When you're satisfied of this, put in the links and 100 ohm resistor. You will then have 100W with no more than 20W drive. A little re-tuning may be required. Total DC current should be around 16A with a 14V supply. If you use only 12V, don't expect any more than 80-85W output. Also, note that the efficiency and power gain of transistor amplifiers is critically dependent on the collector supply voltage. I apply 14V DC and use heavy cables to minimise voltage drops. Even so, at full output the collector voltage is about 13.5V. Be aware that at 100W output there is not much margin for error: a high SWR will surely destroy the transistors. Here are a couple of photographs showing where to place the wire links through the board. 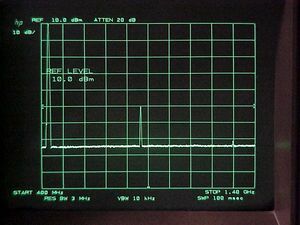 The photo above shows a measurement of the spectral purity of this amplifier operating at 100W output. Note the second harmonic is -50 dBc and third harmonic is below -70 dBc. 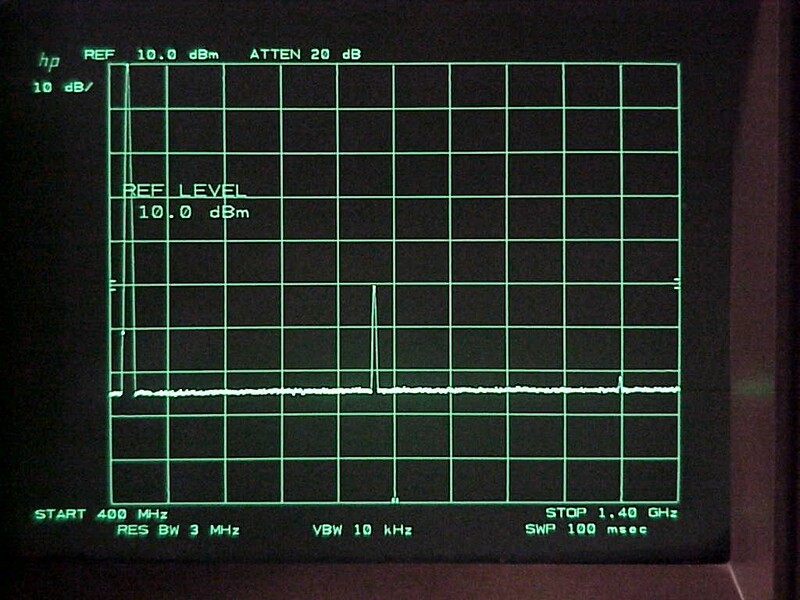 No need for low-pass filters! Below are two pictures of the IT9VKY prototype amplifier spectral purity.